When it comes to the goods transported by merchants from Bremen and Hamburg to the North Atlantic islands we have only limited sources at hand. The few extant account books list the commodities they sold to the inhabitants of the islands in return for stockfish, fish oil, sulphur or woolen cloth. But the written sources are not precise but rather general and never tell where the exported goods were manufactured. To complicate matters, (archaeological) material culture of the German period is scarce. Most of the goods traded by the Germans were bulk material such as grain or flour, cloth, timber, and beer, and to a lesser extent every day items that were hard to get on the islands: horse shoes, tools, knifes, wax etc. Many of these goods, especially those of organic material, have long been gone. Ceramics, however, are a different matter. Icelanders did not produce ceramic vessels (and the Faroese and Shetlanders only to a limited extent) which means that all pots, pans, jugs and beakers needed to be imported. A considerable amount of pottery from the 15th to 17th centuries has been found in Iceland, Shetland and Faroe but what can pottery sherds tell us about that trade? Fragments of a so called “Schnelle”, a tankard produced in Siegburg in the 16th century, found at Tórshavn, the German trading station in the Faroe islands (photograph by Helgi Michelsen). 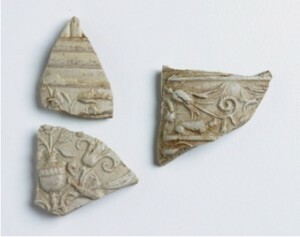 The sherds that have survived from excavations and in museum collections in Iceland show characteristic traits of wares common in Northern Europe. The ceramic assemblages of sites such as Gautavík (a German trading site in the East), Viðey (a monastery near Reykjavík), or Stóraborg (a farm at the South coast) consist of two distinctive ware groups: stonewares and redwares. Stoneware was used to produce drinking vessels such as jugs and beakers. They were widely traded over Northern Europe, via the river Rhine and ports of Northern Germany and the Netherlands. For the trained eye, these stonewares are relatively easy to determine. The majority stems from the famous medieval and early modern production centres along the Rhine such as Siegburg, Frechen, or Cologne; a second group can be traced back to Lower Saxony. The origin of redwares, a general term for cooking vessels (pots, pans) and plates consisting of earthenware, is far more problematic to identify. Vessel shapes and fabrics of pottery workshops are generally very similar over a large area and it is therefore hard to determine where exactly a certain redware pot was produced. 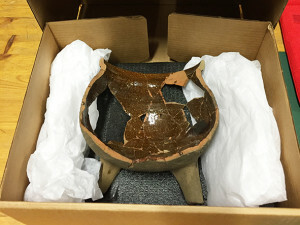 Distinguishing the redwares is mostly based on typological characteristics such as a distinctive form of the rim of a pot, but the Icelandic archaeological material is often too fragmented to allow an identification beyond doubts. However, provenancing these redwares would considerably change our understanding of the trade mechanisms and pottery consumption patterns in the North Atlantic. Fragmented redware tripod with internal lead glaze found at the trading site of Gautavík, Iceland. It dates to the late 16th century but the place of origin remains enigmatic (photograph by Natascha Mehler). Luckily, there are other methods than typology to identify the provenance of pottery. In recent years, ICP analysis (inductively coupled plasma mass spectrometry), widely used in archaeological science, has proven to be a reliable method to determine the chemical fingerprint of the clays used for the production of ceramic vessels. ICP analysis has been applied successfully at a large number of redwares produced in Southern Scandinavia and Germany, with ground breaking work done by Torbjörn Brorsson (Kontoret för Keramiska Studier, Sweden) and Jette Linaa (Moesgaard Museum, Denmark). This means that we now have a solid base of reference material at hand which is necessary to securely identify the origin of the redwares in question. 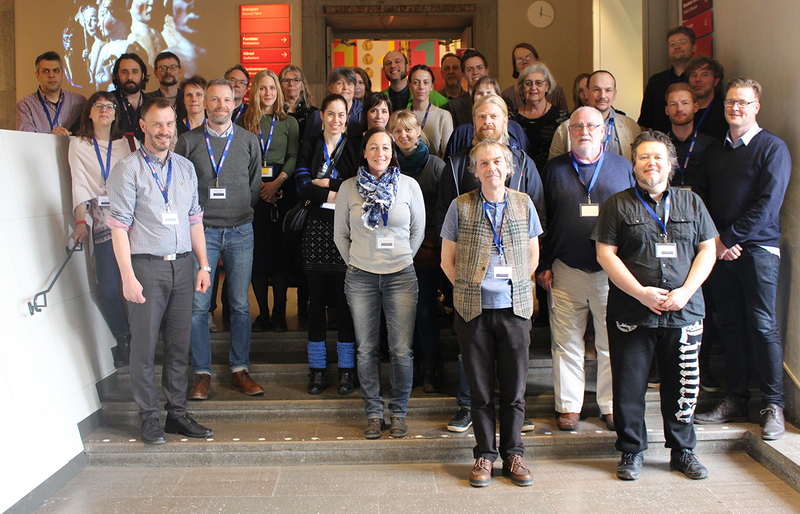 The application of the method in ceramic studies and an overview on the data reference material was presented in April 2016 at the inaugural meeting of the Baltic and North Atlantic Pottery Research Group (BNPG) which took place at the Historiska Museet Stockholm. In summer 2016, redware fragments from selected sites in Iceland, Shetland and Faroe will be sampled in order to conduct ICP analysis. We will report on the results of the analysis, and what this means for the interpretation of the trading connections between Northern Germany and the North Atlantic islands. Torbjörn Brorsson, A new method to determine the provenance of pottery – ICP analysis of pottery from Viking age settlements in Northern Europe. In: S. Kleingärtner, U. Müller, J. Scheschkewitz (eds. ), Kulturwandel im Spannungsfeld von Tradition und Innovation. Festschrift for Michael Müller-Wille. Neumünster, 2013, 59-66. Adolf Hofmeister, Das Schuldbuch eines Bremer Islandfahrers aus dem Jahre 1558. Bremisches Jahrbuch 80, 2001, 20-50. Natascha Mehler, Die mittelalterliche Importkeramik Islands. Current Issues in Nordic Archaeology. Proceedings of the 21st Conference of Nordic Archaeologists, 6-9 September 2001, Akureyri, Iceland. Reykjavik 2004, 167-170. Finally a summary of our project written in Icelandic! 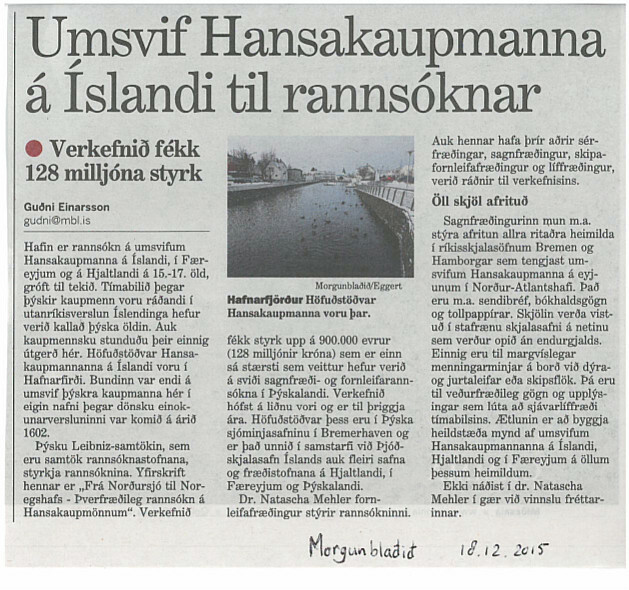 Published in Morgunblaðið, 15 December 2015. With kind permission of the author Guðni Einarsson. On Wednesday, 4 November 2015, Dr. Guðbjörg Ásta Ólafsdóttir and Dr. Ragnar Edvardsson, University of Iceland, will speak about their new research project on the history of cod fishing in the North Atlantic. The lecture takes place at the German Maritime Museum in Bremerhaven, starting 14:00, and is open to anyone interested. Here is a short summary about the content of the lecture. For the banner of this blog and our facebook page, we have displayed a section of the famous Carta Marina from 1539. On a first glance of the map, the many marvellous creatures that inhabit the land and the sea immediately catch the eye of the beholder, yet it also provides us with a good overview of the contemporary North Atlantic trade. Time to explore this remarkable document a bit further. 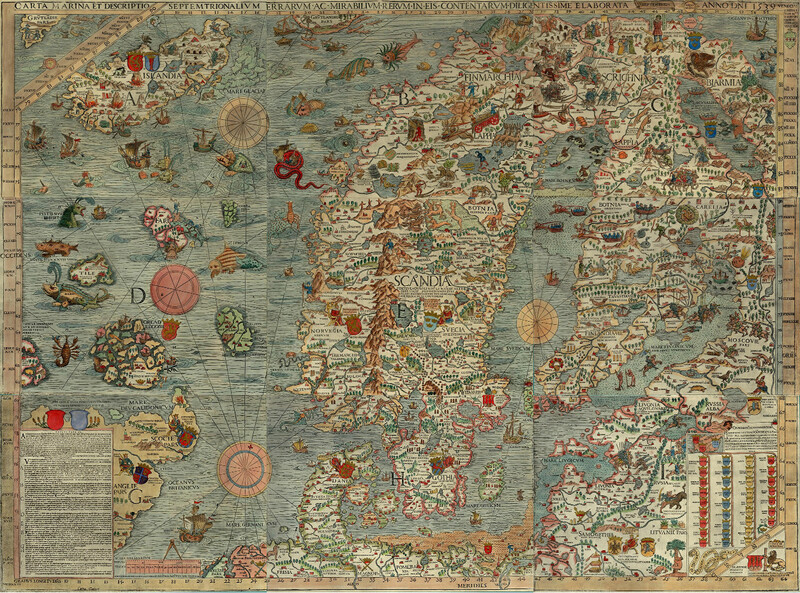 The map was made by Olaus Magnus (1490-1557), the brother of the last catholic bishop of Sweden. He had travelled Scandinavia and the lands around the Baltic Sea extensively before he was sent on a diplomatic mission to Rome by the Swedish king Gustav Vasa. He was never to return home. Dissatisfied by the Reformation in his homeland, Magnus stayed abroad, first in Lübeck and Danzig, later for a long time in Italy, soon joined by his expelled brother Johannes Magnus. In Italy he kept close contacts to learned men of his age, among others cartographers and travellers. 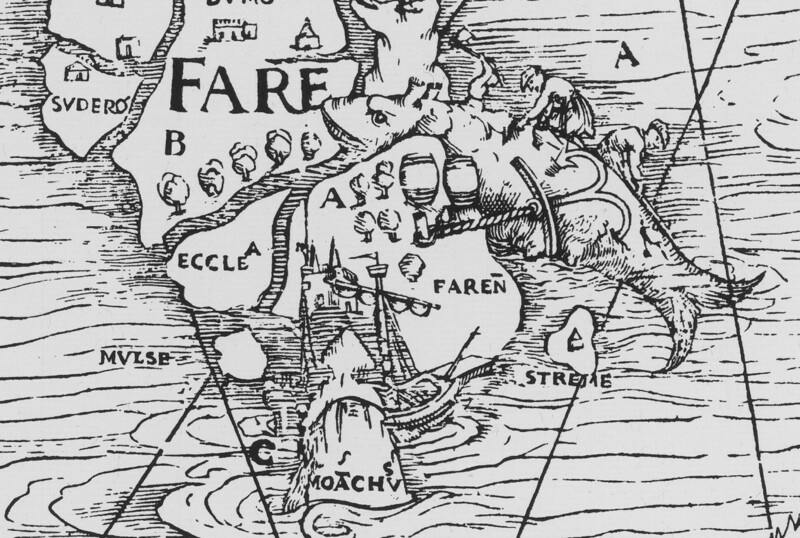 Under influence from these social circles, Magnus decided to transform his own knowledge about Northern Europe onto a map, which would appear in print in Venice in 1539. It was the first large-scale map of Scandinavia to be ever made, and had much influence on European cartography for the next decades. However, because of its high costs, the number of copies remained low. The map itself disappeared off the map of European learning, and was deemed to be lost since the late sixteenth century. Luckily in 1886 an intact copy of the map was discovered in the Bavarian State Library in Munich, and in 1961 another one, which now resides in Uppsala. 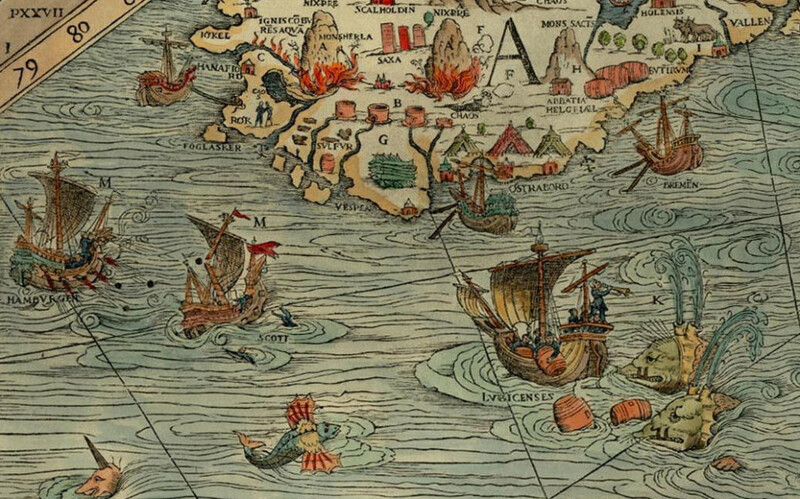 An explanation of the map appeared only in 1555 as Historia de gentibus septentrionalibus. In this book, Olaus Magnus described the geography, wildlife, and customs of the people of the North, illustrated with woodcuts. These woodcuts are clearly based on parts of the map, which includes many details about the people of the North, the political situation of the time, and the nature and wildlife. We can see kings sitting on their thrones, armies crossing the frozen Baltic Sea, people hunting seals, the most important towns and cities, lighthouses, whales attacking ships, enormous snakes, swimming cows and other sea monsters. The map is divided into nine parts, marked A-I. It covers the entire Scandinavian peninsula, the Baltic, Northern Germany and the Netherlands, the entire North Sea and North Atlantic, including the coastline of Britain, the southern tip of Greenland and the mythical island Thule, known from classical geographical works. Of our interest are mainly the sections A and D, covering a large part of the North Atlantic. Olaus Magnus probably never visited the North Atlantic himself. Instead, he had to rely on the stories and descriptions of others, for example the Northern German traders that told him about Iceland, the Shetlands and the Faroe Islands. Of the Shetlands and Faroes, Magnus must have had few information, as these archipelagos are only schematically drawn. One remarkable detail can be found on the Faroes, though, where we can see a whale being slaughtered on the shore, reminiscing a practice of hunting whales by driving them up the shore which is still practiced today. For Iceland, Magnus was clearly better informed. 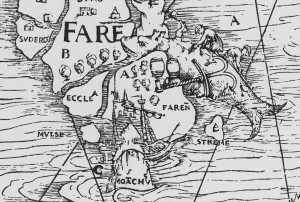 The Carta Marina was the first map that drew the island in its more or less actual shape. Moreover, three vulcanoes attest to Magnus’s knowledge of the high vulcanic activity on the island. The two episcopal sees, Hólar (Holensis) and Skálholt (Scalholdin), are displayed, as well as the monastery Helgafell (Abbatia Helgfiall), which was famed for its butter production (butirum). The three knights on the eastern part of Iceland should probably be seen as an indication of Danish military presence on the island. Three volcanoes on Iceland, from Historia de gentibus septentrionalibus (1555), photo: Wikimedia Commons. Better than the natural, religious, and political situation, the map attests of the economic situation. Firstly, the main export goods of Iceland are indicated. These are, besides the already mentioned butter: stockfish, sulphur, and falcons. Stockfish was dried cod, highly valued in Europe as a preservable source of protein, and the main trade good of the arctic region. It is shown on a pile on the south coast. Just north of it, three containers of sulphur are depicted. Iceland was one of the few places where pure sulphur could be found. Sulphur, being among others a key ingredient for making gunpowder, was a highly valued substance. Finally, a gyr falcon (falco albus) can be seen on one of the northern peninsulas of Iceland. Gyr falcons are only found in arctic regions, and due to its being the largest and strongest species of falcon, it was highly valued by the nobility for use in falconry. Apart from the export goods, the realities of the north atlantic trade are displayed in considerable detail on the map. Various trading harbours are indicated, most notably Hafnarfjörður (Hanafiord), where merchants from Hamburg had built a church. We can see ships lying at anchor at these harbours, and three tents at Ostrabord, which probably indicate the temporary booths the merchants set up on the shore and where they displayed their goods on sale during the summer. The most important countries and cities trading with the island are also indicated. We can see a ship from Bremen at anchor near Ostrabord, an English ship which confused a whale for an island, a ship from Lübeck being attacked by whales, and a Scottish ship under attack by one from Hamburg, indicating the dominance of Hamburg in the North Atlantic trade. It was no exception that competition between merchants from different places led to violent clashes, as in 1523, when the crews of ships from Bremen and Hamburg attacked an English ship in a conflict over the rightful ownership of an amount of stockfish, resulting in casualties among the English. These elements make the Carta Marina a wonderful visual testimony of the North Atlantic trade in the sixteenth century.